Prepared to be impressed with this beautiful home located in the highly desirable upper Riviera. The property is located on a large 9,362 sq ft lot and features a sun-lit living room with vaulted ceilings and French doors opening up to a majestic back-yard. The remodeled kitchen is a chef's dream, with gorgeous granite counter tops, a mosaic tile backsplash and stainless steel appliances. The kitchen also opens up to a lovely dining area which features a dramatic tall chandelier and vaulted ceiling, and French doors which also lead to the grassy backyard. The living room is flooded with light from the wall of windows, and includes two remote control skylights, a fireplace, hardwood floors, vaulted/beamed ceilings and French doors. The large family room upstairs has built-in shelves and cabinets, recessed lights, a bay window with city and mountain views, a balcony and fireplace -- perfect for movie night or game time. There is even a bonus room, next to the family room, perfect as an office or kids play room. The serene backyard includes two lovely covered brick patios, a putting green and plenty of room for the entire family and entertaining. 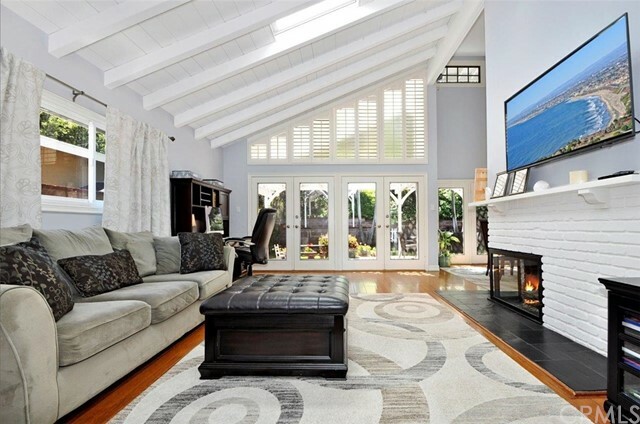 Home is located just a short stroll to Rocketship Park, Riviera Elementary School and the Palos Verdes walking trail. This home is a dream come true!